Mr. Brian Murphy's classes have been busy doing a variety of activities this semester. Eighth grade American History is just starting to produce a digital newspaper about westward expansion. High School American History is entering a unit on U.S. involvement in World War II. The Post World War II History class has been investigating the 1960s. In freshman World Geography, students prepared travel brochures for U.S. regions or states. 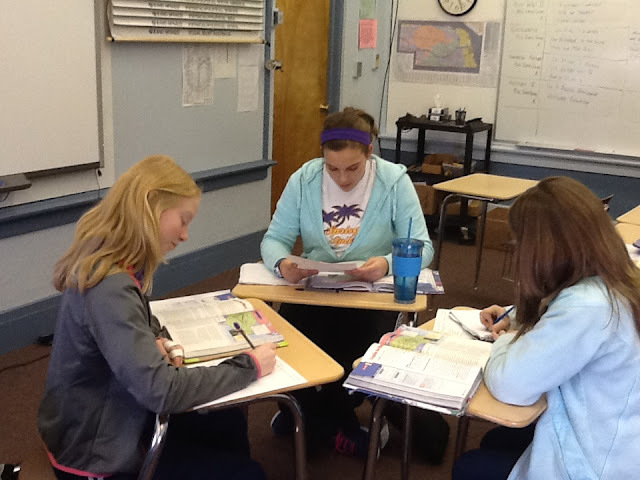 This semester, there is a map quiz each week over different regions, countries, cities, and landforms of the world. Pictured are eighth graders Joan Strate, Sydney Hall, and Haylee Sheffield researching for their digital newspaper project.